Too late for Thanksgiving, but just in time for coping with the next round of holidays, I discovered An Adult Child Abuse Survivor’s Guide to the Holidays. This article is so amazing : practical, empowering, empathic with just the right amount of humor. I love the key idea “Don’t Abandon Yourself”. Although written with adult survivors of abuse contending with families of origin, including perpetrators, it really could be invaluable for anyone from a dysfunctional family of any sort. Or even just useful strategies for keeping in touch with yourself and grounded while dealing with anyone challenging for you. I like this so very much I want to share an excerpt here. I highly encourage reading it in full. Tremendous thanks to Grace Davis for this gem of a resource. I can’t say this enough – do not abandon yourself. You were abandoned as a child. You did not deserve this. No child deserves this. So, as adults, we take care of ourselves as if we are our own precious child. Imagine taking your child-self gently but firmly by their lovely, grubby little hand and getting them out of harm’s way. There are many ways to do this whether you are in the presence of perpetrators and their allies (like your own dismissive and scornful siblings who get angry whenever you mention the legacy and source of your pain) or if you’re in a place where you may be triggered. The following is listed in no particular order of importance because it’s all important. I respect that some of these ideas may work for you, some may not. As long as you keep that all-encompassing guidance “Do not abandon yourself” in mind, you can take it from there. Remember who you are TODAY. You are no longer a child. Indeed, there is a hurt child who is alive and well within you. But, now you’re an adult who can make choices. Don’t forget, you are an adult and you have power over your life. One of the choices you can make is to not go to the abusive family’s house. You don’t have to go. You can tell them you’re sick if you can’t tell them the actual reason for your absence. It’s okay to “lie” in this situation if fear keeps you from telling the truth of the matter. It’s not really a lie, though. The abuse was and is responsible for its consequences that you may suffer from – depression, anxiety, post-traumatic stress disorder. If you do “call in sick”, don’t answer the phone if you know your abusive family members are trying to call your cell or land line To this, I say – thank you, technology, for caller ID. Don’t answer the calls from your abusive family members for up to a week. Then, if you must, call back and say you’re feeling better. And, when I say”better”, I mean that you’re probably doing great because you didn’t spend time with people who were not good to you and continue to be bad to you. Go to your abuser’s house with your real family, your husband, your kids, your chosen family of dear friends who believe in you. If you need support and active reminders of who you are now, take your supportive people with you. These people are your true family members who love you, won’t abandon you and remind you of who you are today. This is a big one – STAY SOBER. I cannot emphasize that enough. If you get drunk or high, you will lose that centered spot. You will relax, that’s true, but it’s a false sense of ease. Do take your Xanax if necessary but stick to your prescribed dose. The Bloggess will always recommend that you should avoid knocking back handfuls of the Judy Garland Trail Mix. And, there you go, a little Bloggess humor for you on a tough day. Help in the kitchen. Be involved with the preparation. Do this only if such activities are not triggering. I always do this. I put my head down and work. I set the table, I do the dishes, I cook. I put my head down and work it, like a Zen monk whose practice includes performing chores mindfully. That’s an excellent way to stay centered, pretending to be a Zen monk and doing tasks wholeheartedly. Sit by a window so you can look outside. When you pull in the outside world as you sit with those who abandoned you, the world becomes that much bigger. There’s more out there, beyond the dark cave of the abuser’s house. Go beyond looking out the window and get out there in that bigger world. Expand your universe. The abuser’s house or the house with the abusers in it is not the core of the world. The world is beyond that house. In this world there are people who believe in you and love you unconditionally. That world contains your working life where you are valued or perhaps your university studies where you excel. So, go outside for a few minutes and take a walk in the bigger world. Put your therapist’s number on fast dial. Call anytime. Even if you reach their voice mail, leave a message. Don’t fret if they don’t call back. Instead, revel in the knowledge that you were wise enough to reach out. You asked for help and that action alone is therapeutic. Keeping your therapist in mind, remember the tricks and tools they have suggested to help you through these tough times. For example, I like to use what all of my therapists taught me – the classic meditation exercise of sitting comfortably and going to my inner place of refuge. 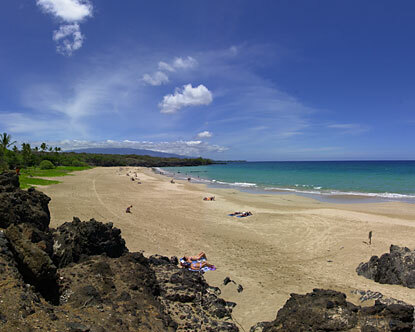 FYI – it’s a beach on the Big Island of Hawaii. Not bad, eh? Minimize conversation with the perpetrator and anyone who has been abusive to you. Again, you can say you’re not feeling well, you have a headache, you need to be quiet. And, again, you ain’t lying here. That person makes you feel unwell and your head probably hurts when you’re around them. If you cannot avoid conversations with those people, keep something in your pocket to remind yourself of who you are today. I use a little plastic monkey from the Barrel of Monkeys toy-game. Small and with a defined shape, the monkey reminds me of the relative light heartedness of my life away from the abusers. Also, a monkey is not to be messed with and you can pretend the monkey is throwing feces at whoever needs to be taken down. You can also keep your cell phone on to Twitter, Facebook or chat or whatever you use for social media interactions. Set it to buzz everytime you get an update. Another reminder of the bigger world out there and that you’re part of that bigger, better world. Everyone, no matter how badaas and brave they seem to be, is scared shitless to do this. I was scared to do this. But, I’ve done it and I’ll do it again if I need to because it felt exhilarating, liberating and life affirming. Don’t leave yelling, but if you do, try to cry, yell some more or laugh really hard once you’re out the door to release what is truly an emotional atomic bomb full of energy. Really try to do that before you get in the car. Do not drive home in an intense emotional state as you are not centered and in control. Respect your anger and anguish and give it time to release and subside. You will feel better and that will help you think clearly as you operate that moving vehicle. This entry was posted in Abuse, Childhood Abuse, Family, Health, Holidays, Psychologist, Relationships, Self-care, Severe Trauma, Trauma and tagged Abuse, An Adult Child Abuse Survivor's Guide to the Holidays, Child Abuse, Childhood Abuse, Health, Holidays, Mental Health, Perpetrators, Self-care, Trauma, Trauma Survivors. Bookmark the permalink. Thanks for sharing this wonderfully empowering list. My abusers are dead now so I don’t have to see them face to face at “family” gatherings. I especially like “Do not abandon yourself.” and walking out the door if things get too emotional. thanks for reading! it is the sort of thing I am just delighted to find and pass on. I think it can be helpful to so many. Thank you for honoring me with this entry. Please know that I am so grateful for your work with us, adult survivors of child abuse. I am happy to share this valuable resource. I needed to read that this morning. I am glad you found it then! It is a powerful statement, isn’t it? This is good advice. When my abuser brother died I did not go to the funeral even though it angered and upset everyone else in the family. I did not care. I was not going! I STILL feel good about that decision and would do the same thing today if I had to do it over again. I think it is terrific that you knew what you needed and stuck to it despite less than supportive reactions. Good for you! I took the tact of just not going. I stated my boundaries (no contact with the abuser — that included talking about him, negative or positive). After 3 tries my mother was unable/unwilling to do this, so I followed through and said “I can’t be there because it is not a safe place for me to be.” Sometimes hard this time of year to not have family but thanks for the reminder that Not Abandoning Myself is important. This will be my 2nd holiday season as a self-imposed “orphan” and it is going be better and brighter than last year! Thanks again for the reassuring (and humorous) words! Thank you for what is for me, new advice. If you will not have a way to leave that doesn’t depend on them, DON’T GO. That last bit, about walking out the door — that doesn’t work if you’re staying in their house, or if you are dependent on them or someone else at the party (unless that someone is in your group of allies and has agreed to back you on this) for a ride home. Do not let yourself be trapped like this. No matter how dire the family drama from you not going is, it will NOT be worse than being trapped with your abuser and his/her allies and having no way out. What do you do when you have a child of your own…who has their own relationship(s) with their cousins/grandparents/aunts/uncles who did not specifically harm you, but may have let harm occur in the first place? You can’t just leave…without telling your child of the reasons. You have to stay. Regardless of the pain. Right?! Every situation is unique Angie, so I hope you are talking this through with someone who know your specifics. In general, I don’t believe that it helps children for parents to ignore their own feelings and pain and “just stay” in environments that are toxic or abusive. I also think it can be helpful to tell your children age-appropriate versions of what happened for you in your family. It can be as simple as “Grandpa was mean to me when I was growing up so I can’t be around him right now”, for example. Also, if family members allowed harm to happen to you as a child, it is really important to consider how much they have changed. Would they be equipped to protect you own children if needed? DO NOT ABANDON YOURSELF. The holidays are a time for self-care too, take care not to repeat childhood patterns of ignoring your feelings. They matter. You matter.